Has the water I sampled kept the propertiesI want to measure? Sample container: When a sample is removed from its water source, it begins to establish a chemical equilibrium with its surroundings. As we are interested in Arsenic, an inorganic compound, we have to choose a container material that will interfere the least possible with Arsenic. In a glass bottle, Arsenic can be adsorbed by the glass because charges are found at the surface of the bottle. Hence, the best is to use an organic material, as plastic (a teacher from EPFL advises me to use PE). Besides, the container must be properly cleaned before use to ensure that no Arsenic was in the container before sample collection. I was advised to clean with acid and then wash with distillate water. If we want to do the best, the container has to prevent light exposure of the sample. Control samples: In order to be sure that our measure is the nearest possible from reality, we control that no bias occurred during sampling. The problem with any compound is interactions with sampling material and the problem specific to Arsenic is oxidation by the air. Hence, we need at least two controls (2 problems = 2 controls), plus a control of the measuring kit.The first is a blank sample: fill a bottle with water you know to contain no analyte (here, Arsenic) and measure it with your kit: it will show you if a contamination occur because of uncleaned bottle or bad measurement kit. We can make a second blank filling a bottle with water which we know the concentration of Arsenic to test if a reaction occur with the container and calibrate better the measurement kit. The second is a trip blank sample: fill a bottle with water with a known concentration of analyte and take it with you during the collection trip. 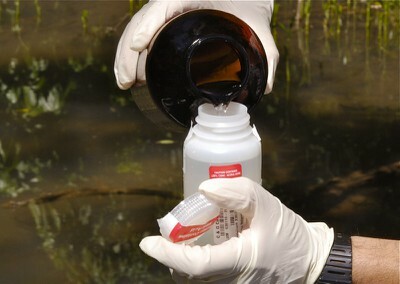 During the manipulations to collect water samples, open the trip blank bottle. 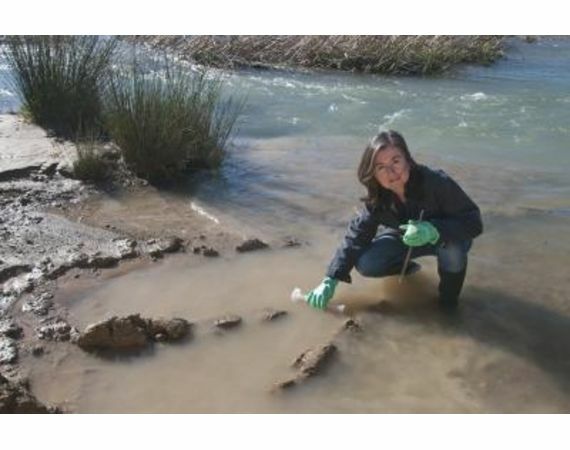 Close it after the end of the manipulations and measure it in the same conditions as the collected samples. This will allow us to know to which extent a oxidation could take place. Conservation: Professional labs using spectrometry to measure Arsenic concentration are acidifying the samples to conserve them and keep measurable properties. Depending on the conditions the measurement kits need, it is not possible for us. The best solution is to measure rapidly the sample. Otherwise, it must be kept at a low temperature (4-5°C). You can find other informations on wikipedia, or on US protocols for Arsenic speciation.